"Ardroid 3 has stopped working, Windows is checking for a solution to the problem..."
I'm using Windows 10 and AirDroid version 3.3.0. I couldn't really find any other relevant information, but I'd be happy to provide any. 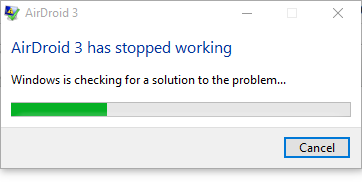 Re: "Ardroid 3 has stopped working, Windows is checking for a solution to the problem..."
I am getting a similar error while opening the app on my pc. Using Win 8.1 32 bit OS. Tried the above solution but of no use. Can you please suggest any other way to get rid of the error.